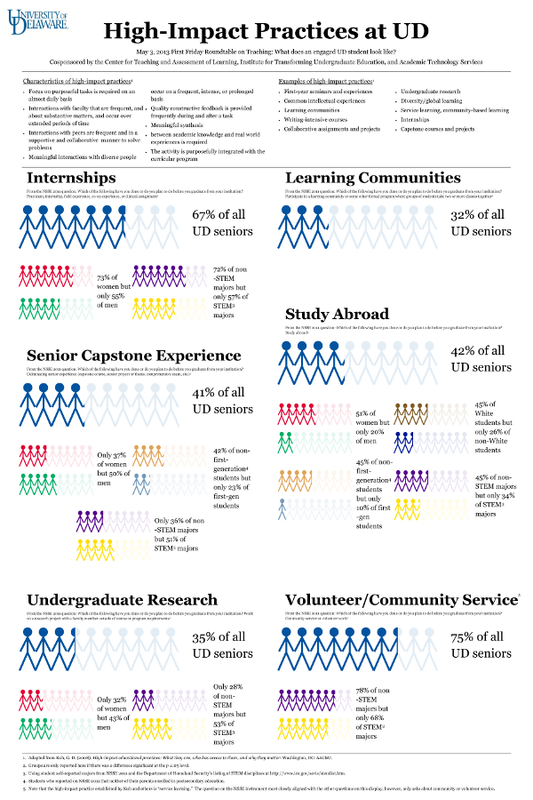 Infographic of University of Delaware senior student participation in selected high-impact practices from NSSE 2011. This image links to the full-size graphic. Last week, my colleagues and I presented the final UD First Friday Roundtable on Teaching of this semester.Â We focused on “student engagement,” specifically naming the session “What Does an Engaged UD Student Look Like?”Â It was a good session with lots of great discussion but right now I want to narrowly and briefly focus on two graphics that we whipped up for our supporting materials. 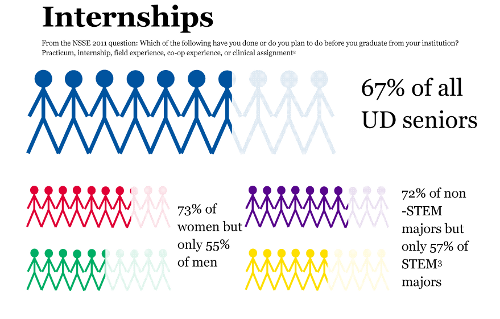 The first image in which you might be interested is a simple infographic showing University of Delaware student participation in some high-impact practices as extrapolated from NSSE 2011 responses.Â Â The image to the right shows one part of the entire image to give you an idea what it looks like. This extract from the full-size image links to the a larger version of the full infographic; some of the text is too small to read even in that large image so you can also download the full-size pdf. It worked out quite well as a full-size poster and I also modified it to work as a handout for attendees.Â It’s not bad for the amount of time I had to put into it although I would have liked to have done a lot more and a lot better. For each of the six selected high-impact practices, I included not only the overall percentage of senior students who reported participating in them but also the subgroups for which there were significant (p â‰¤ .05) differences.Â I looked at differences between students of different genders, white and non-white students, students in STEM and non-STEM disciplines, and first-generation and non-first-generation students.Â If I had more time, I would have loved to have created another set of graphics illustrating the impact of these practices or some broader measure of student engagement on self-reported GPA and gains especially if these data showed what the national data tend to show is that these activities or engagement overall sometimes has more impact on different kinds of students. The second image is a simple word cloud we used on some of our materials such as the agenda and signs.Â I know that word clouds are passÃ© (or maybe I’m the only one who thinks so) but this was a really simple and quick image for us to create.Â Just as important, it was closely tied to the topic of the event as we used the text of one of the primary resources – Kuh’s 2008 AAC&U high-impact practices publication* -Â we used to develop and think about the event as the input for the word cloud generated using Tagxedo. * Kuh, G. D. (2008). High-impact educational practices: What they are, who has access to them, and why they matter. Washington, DC: AAC&U. Previous Previous post: Are High Impact Practices Available Online?